Notepads is rated 4.4 out of 5 by 27. Rated 3 out of 5 by Karina from Better binding glue needed The first few pages of the notebooks fell off nearly immediately. If the binding was secure then I would give this 5 starts since everything else turned out great! Rated 5 out of 5 by MaxSPL from Looked Great! Ordered these and had them expedited, and they turned out great! Rated 5 out of 5 by Car7777777 from Amazing product! The quality of the notepads is great. The printing is exactly as I ordered it. Will buy again! Rated 4 out of 5 by Luke K from Product quality was good, with a good turnaround I bought these notepads to use as answer sheets for our upcoming trivia night and they turned out great! Arrived quickly and packaging was orderly. Modifications to the upload had to be made, due to a specific design software we have. As a result, a very minor change on the design was made that I didn’t catch in the proof until I saw the actual product. So that’s on my end. Note to Self: Order notepad printing from 48HourPrint.com for a memorable giveaway. Our online custom notepad printing services deliver high quality notepad printing at prices you can afford. You not only get something that people will look forward to using -- you get the peace of mind of great quality printing that is easy on your budget. Notepad printing creates a marketing tool that is used over and over again. Hand out printed custom notepads at your next meeting, tradeshow or special event, and make them part of your corporate identity package. Include your logo, contact information and perhaps a tagline or an inspirational message that captures your mission. With every printed page you have an opportunity to stay top of mind and reinforce your brand, as clients and prospects use your notepad to jot down phone messages or make notes. Our custom notepad printing is offered in small, medium and large sizes, printed on 70# opaque text, full color 1 or 2-sided, uncoated, with 25 or 50 pages per pad. 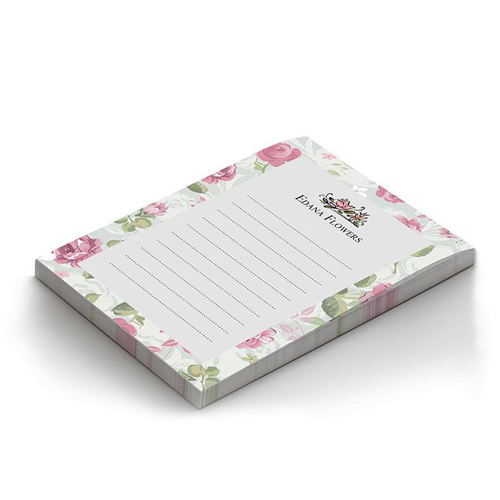 For promotional tips on using notepads, check out our notepad marketing ideas. Also review our layout guidelines to help keep your print job on schedule.